The first licence to gather seaweed in England has been issued to a man living on the south coast of Cornwall. 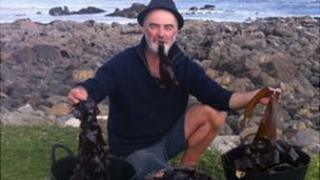 Rory MacPhee, 56, of Falmouth was given the licence by the Crown Estate to hand-harvest and sell "sea vegetables". Mr MacPhee claims people currently harvesting seaweed for sale in England are doing so illegally. He said in these days of economic "doom and gloom" it was a "tremendously exciting new development for Cornwall". Edible seaweed - much sought after as a delicacy - cannot be collected and sold without permission from landowners and environment agencies. Eaten by coastal people since prehistoric times, today 145 species of red, brown or green seaweed are used worldwide as food. In China, Japan and Korea seaweed has for centuries formed part of the daily diet and demand far outstrips supply. Alex Adrian, aquaculture manager for the Crown Estate, said: "Granting this experimental licence is a significant step. "It will help establish whether the commercial harvesting of seaweed can make a viable contribution to the local coastal economy without damaging important natural ecosystems." Trained chef and forager Fergus Drennan said: "We have a coastline that's almost as big as the coastline of Japan, which is the greatest seaweed-eating culture in the world… we've got as many varieties but we just don't use it. "UK waters hold about 630 species, but only around 35 have been used in cooking, so there is plenty of uptapped potential", he added. Mr MacPhee, boat-builder and furniture-maker, gathers the seaweed along the Cornish coast, flattening out the leaves before laying them on rocks to dry. The seaweed is dried and cured and ground into strips and a powder and poured into test tubes and sold. Mr MacPhee said: "Seaweed is rich in nutrients and extremely tasty - a lot of the top chefs are beginning to use it in their dishes." He is hoping that the British will take the "sea vegetable" to their hearts. Mr MacPhee said: "In these days of economic doom and gloom, the food market remains strong with a tremendously exciting new development for Cornwall in the gathering and selling sea vegetables." Seaweed: Should people eat more of it?